Blossom Restaurant, 103 Bowery, Manhattan, October 24, 1935, printed 1970s. Silver gelatin print, 7 ⅜ x 9 ½ in. 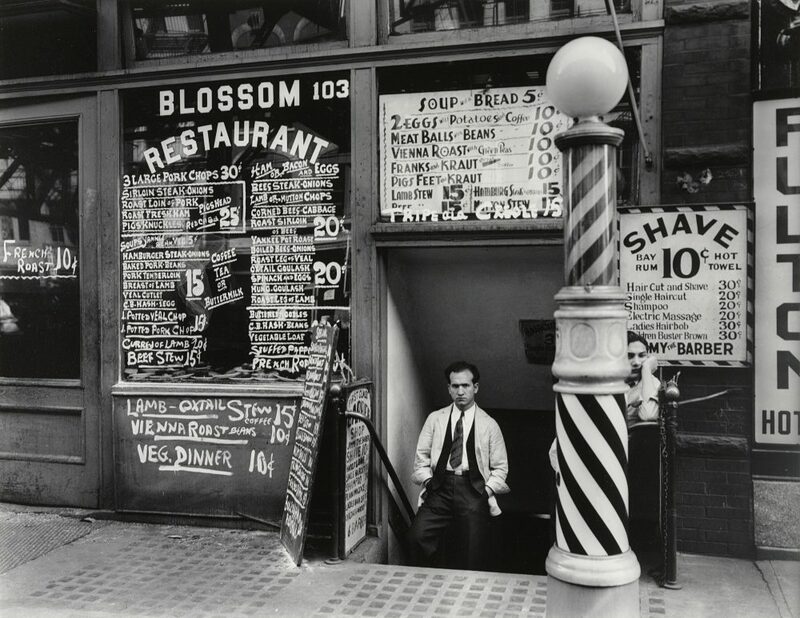 Berenice Abbott, Blossom Restaurant, 103 Bowery, Manhattan, October 24, 1935, printed 1970s. Silver gelatin print, 7 ⅜ x 9 ½ in. Gift of Paul and Anima Katz, M.2018.12.2. I wanted to photograph this subject [1930s shops and street scenes in lower Manhattan] because the signs’ shrieking blatancy literally cried out for a visual record…In black and white the signs shouted, clamored for attention, in visual anarchy. Blossom Restaurant is a large-format camera shot of a high-contrast street scene. Abbott’s practice was defined by her work in late-Depression Era New York, where she trained her camera on the city’s vibrant visual culture and its residents. Bold window signs advertising restaurant offerings and barber shop prices display what Abbott considered the “visual anarchy” of the metropolis. The photograph synthesizes the influences of Eugène Atget’s documentary approach and the commercial work of Abbott’s contemporary André Kertész, into a uniquely American sensibility. Berenice Abbott (1898-1991) is an important figure in the history of photography—an early bridge between art and documentary photography, as well as the photographic circles of Paris and New York. Abbott was also one of the first female photographers to receive major contract work with European and US periodicals. Originally a sculptor by training, Abbott moved to New York in 1918 and met Marcel Duchamp and Man Ray. In the early 1920s, Abbott moved to Paris, where she became a studio assistant for Man Ray and was first exposed to Eugène Atget’s photography. Abbott became the first US photographer to hint at a transnational lineage for the photographic arts.